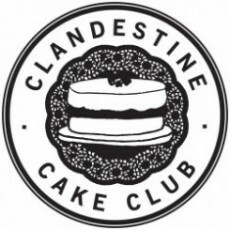 I set the theme for cake club every month, but I never have a cake in mind before I do. I really don't make my life easy, do I?! 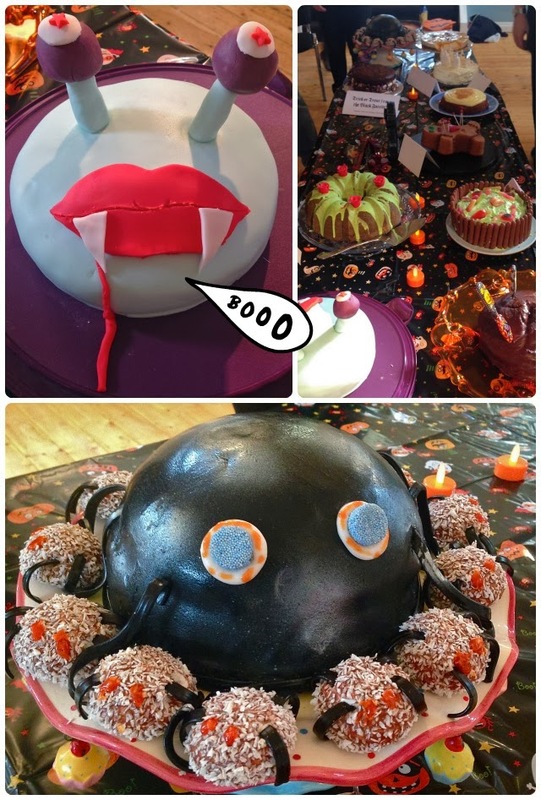 This month I invited my colleagues to join us for our 'Something wicked this way comes' event as part of the Whitworth's Great Office Bake Off. 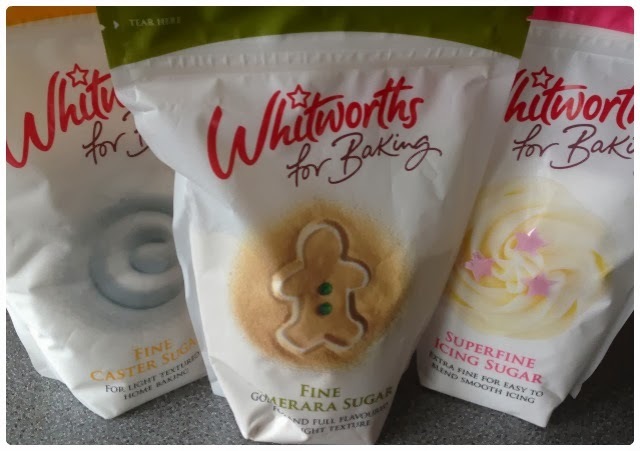 Whitworths kindly offered to donate £200 to our office fundraiser if we encouraged folk to bake. Not a problem! Earlier this year, a dear friend of ours lost her baby boy Charlie and nearly her own life too. The care she received from the Royal Bolton Hospital meant that she's here with us today. We have already raised over £2500 for the Women's Health Unit at the hospital by running a bake sale, a raffle with the most fantastic prizes, and oh yeah... my friend Gemma hurled herself off a 160ft crane. Funnily enough, I got my inspiration from a packet of Whitworth's sugar! There he was. A little gingerbread chap on my demerara. I have a wonderful festive Nordic Ware gingerbread tin... I was going to make that happy little fellow into a monster! 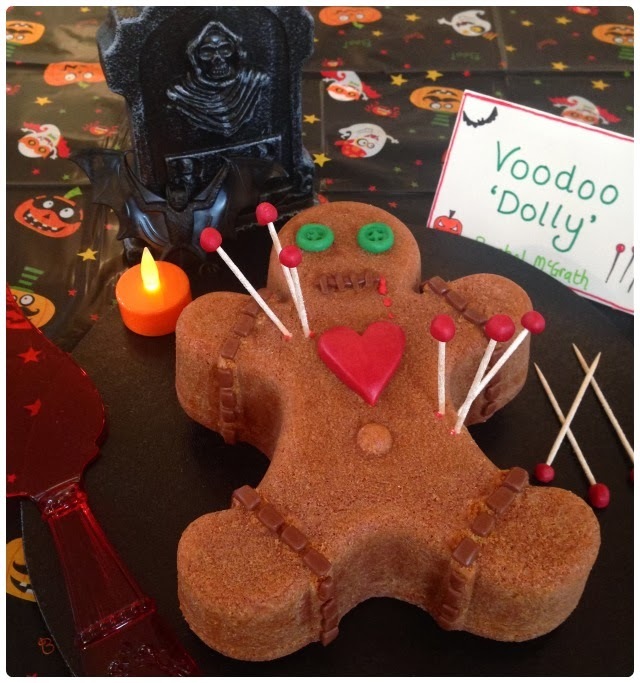 My husband suggested I make a voodoo doll, and since I am 'Dolly', it had to be a voodoo dolly! 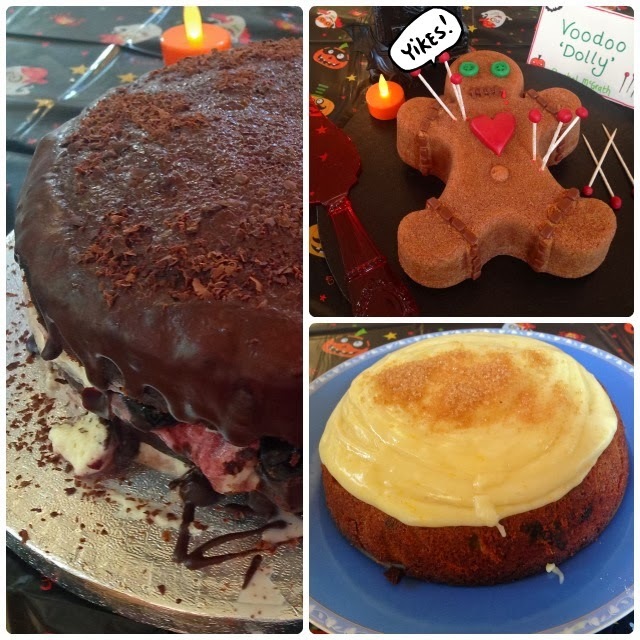 This recipe would work just as well for a festive cake, as it's nice and spicy. Just don't stick pins in him. Or cover him in fake blood. Bob's your uncle. Bits and bobs to decorate - depending on if your fella is going to look evil or not! Grease and flour a regular sized bundt tin - 2.4l, 10 cup, 10 inch. My gingerbread tin is a 6 cup one, so I put the remainder in a mini gingerbread bundt tin. You could use a muffin tin. Pour the yogurt and syrup into a jug, and mix well. Sift in a third of the flour mix followed by half the yogurt. Repeat this until everything is combined. Don't over mix - it will be as tough as old boots. I decorated my voodoo dolly by making accessories out of coloured sugar paste, attached with a little glacé icing made from icing sugar mixed with water. I made the 'pins' out of cocktail sticks covered in edible silver spray topped with a little red sugar paste. Job's a good 'un. 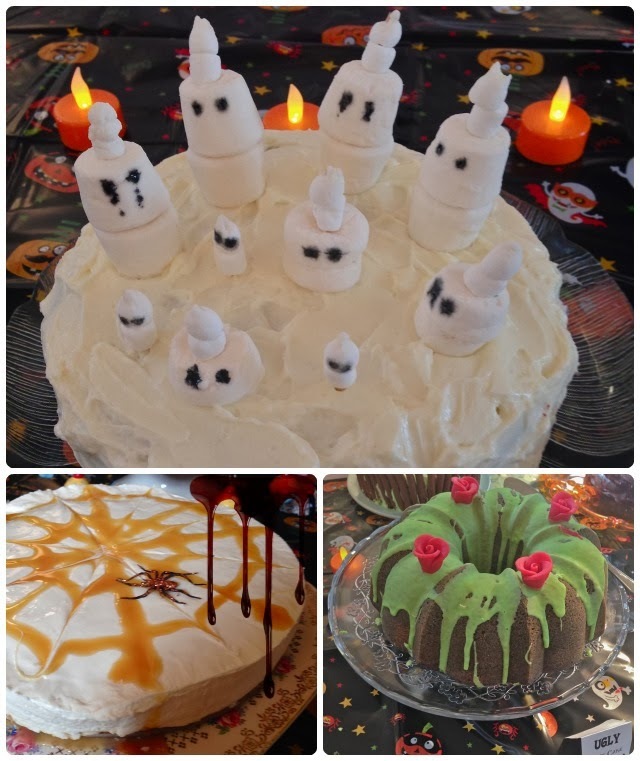 If you fancy doing your own bake off, visit the #GOBO Facebook app, download the toolkit, have a butcher's at the Whitworths For Baking website, or tweet them @WhitworthsSugar. Please use the hashtag #GOBO so we can see them all! Only one lady came to mind - my pal Gemma. 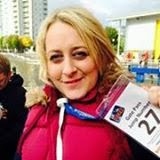 Last Sunday she faced her fear and chucked herself off a 160ft crane over the freezing Salford Docks to raise money for Bolton Hospital's Women's Health Unit. She was utterly terrified, dangling in a cage before leaping off in front of a crowd of her friends and family. 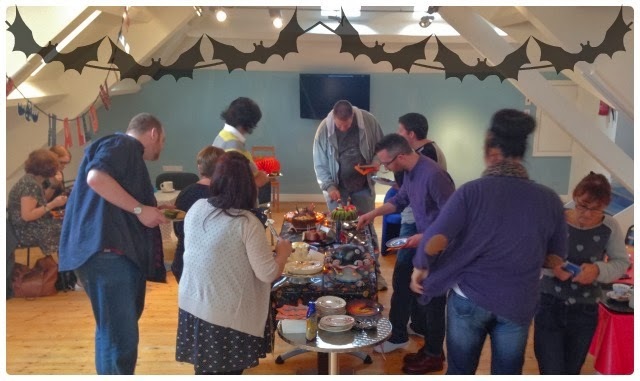 This was all in aid of our Charlie's Angels fundraiser. Earlier this year a dear friend of ours tragically lost her baby boy Charlie, and almost lost her own life too. The Royal Bolton Hospital's Women's Health Unit not only saved Debbie's life, but supported her family through the most difficult time they could ever imagine. As soon as Gemma heard we were running a fundraiser for the hospital, she offered her services without hesitation. 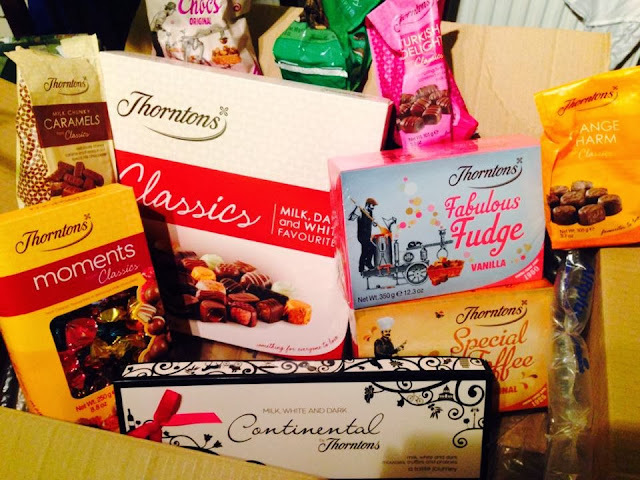 Through Gemma's jump, an amazing bake sale and star studded raffle, we have raised over £2500 for the unit. Debbie's brother and sisters raised an additional £1000 by completing the three peaks challenge. I could not think of a person more deserving than Gemma. Enjoy! Read more about Debbie's story here. 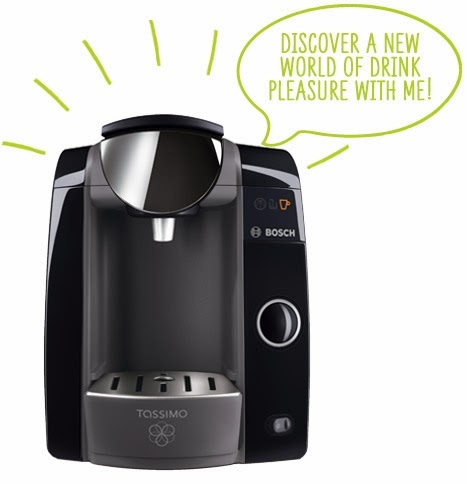 This week I have been testing out the Tassimo Joy coffee machine. Years ago my mum bought this huge coffee contraption that took up half of our kitchen, and I had a huge cappuccino before school very day... yes, I was hyper until about 11am! Tassimo are a far cry from the clunky machine we had back in the 90s. 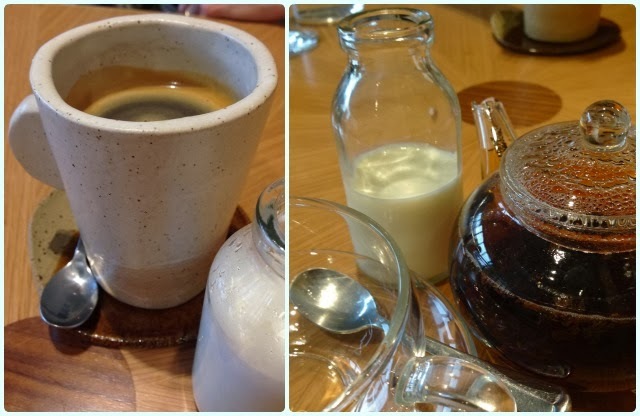 I've loved the range since staying over at the Hand and Flowers in Marlow - we were wired by the time we came to eat our dinner because we had been sampling the different types of coffee on offer in our room. The machine I received was a nice slinky black number, but also comes in red and white. It's really easy to use too; you just fill it up with water, pop a pod in the front and off you go. In just a few minutes I had a fresh cup of coffee - you just wait for the light to stop flashing. If you want to use tall cup, the base comes away to allow more room. It was nice and clean too: just remove the pod and whizz in the bin. My husband likes quite strong coffee, so I bought the Kenco Pure Columbian pods, but there are lots of others available in the supermarket. These were £3.89 from Tesco, which works out at around 25p per cup. Disclaimer: This post is in association with Argos. Click here for more Tassimo coffee machines. 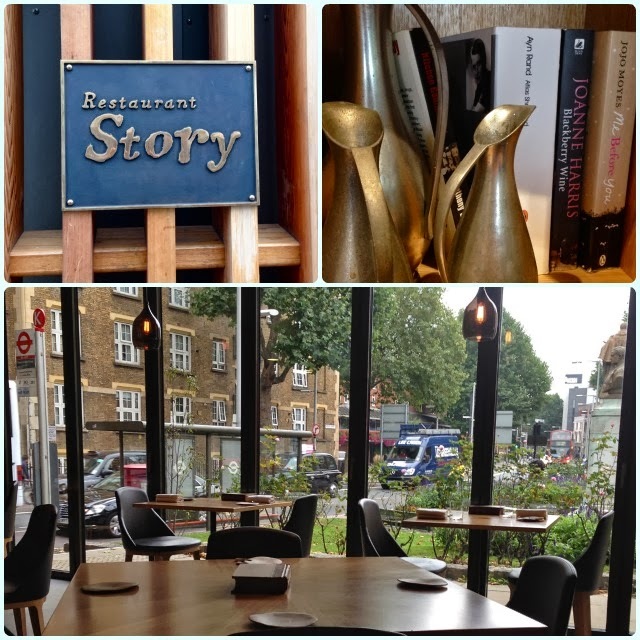 The critics are loving Restaurant Story, the bloggers are going in droves and young chef Tom Sellers is making waves. Sellers has some impressive establishments on his CV, including New York's Per Se and former world number one, Noma. But what I love the most about this young chap's vision, is that his present and future are firmly rooted in his past. Memories of his happy times drive the menu, and create yours. My husband has been itching to go here for months, so on a drizzly day in September we made our way towards London Bridge, not sure what to expect. The building is a simple structure of wood and glass with an interior to match. 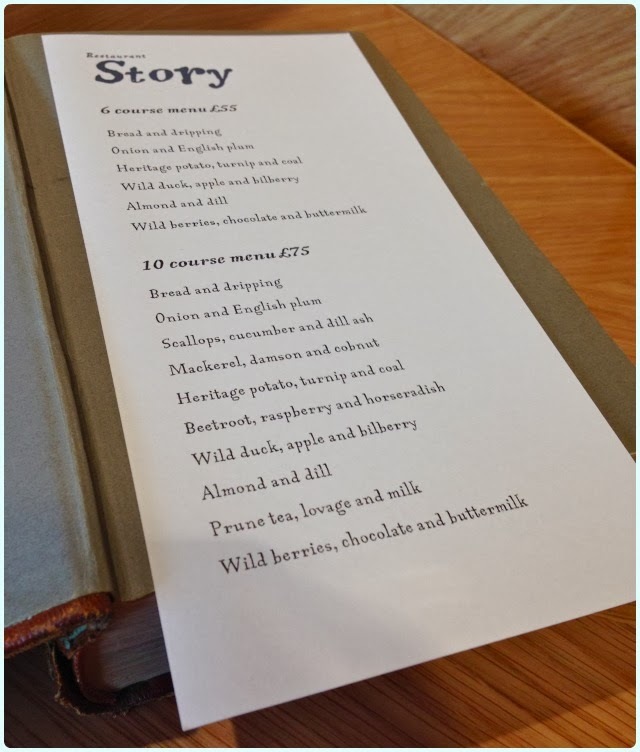 It has a distinctly modern Scandinavian feel but nods towards our English heritage with pewter style jugs and aged copies of literary favourites holding the menus. The atmosphere is relaxed and welcoming, but I still had the excitement that comes with knowing you are about to receive something spectacular. 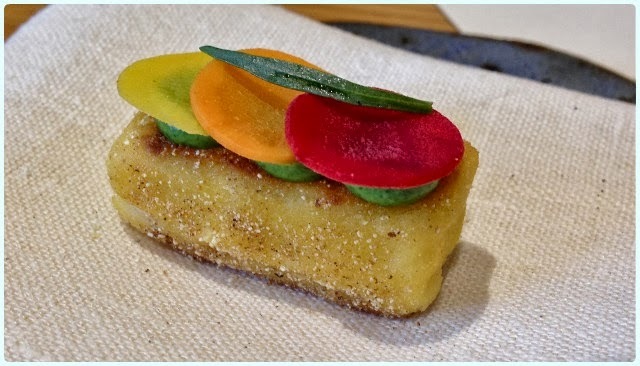 The menu is in tasting form, with the option to do either six or ten courses. We opted for the six course, as the additional dishes were mainly fish or beetroot, neither of which float my boat. The back of the menus are illustrated with curious pen and ink drawings of animals. I was particularly fond of our little otter in chef's whites. Or maybe he was a weasel. Hard to tell. 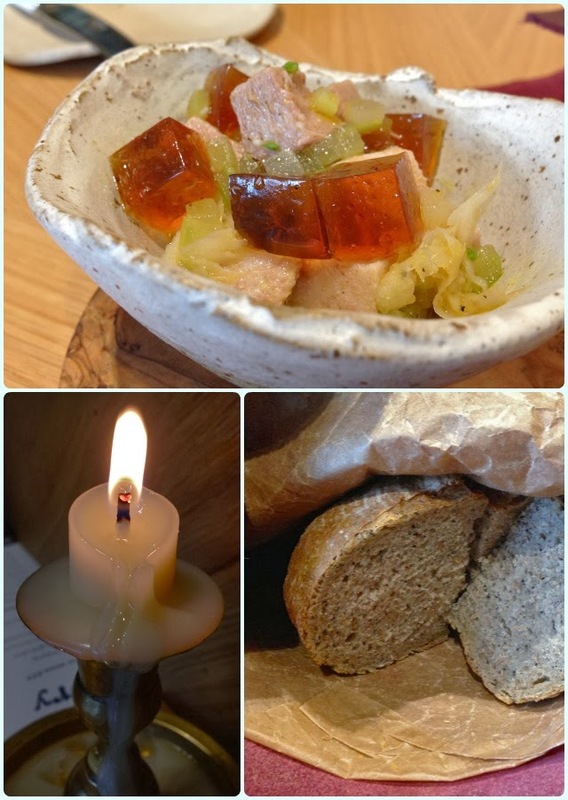 Our waitress explained that at Restaurant Story they like to bring some smaller items to enjoy before your tasting menu begins - absolutely fine by us! 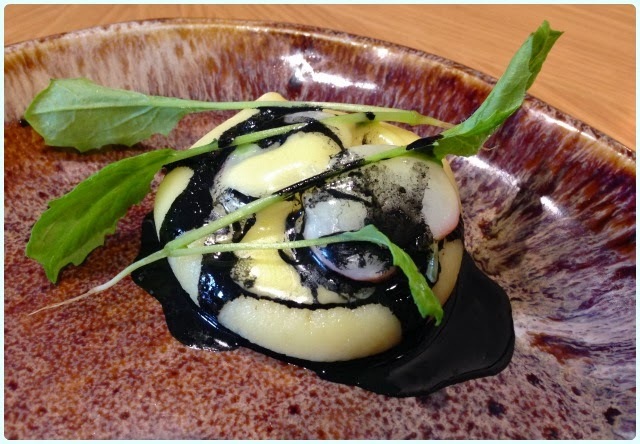 There were six in total, which made our £55 tasting menu even better value for money. Cod skin with cod roe purée and carrot tops: Despite the fact I'm not a fish fan (they can breathe underwater you know!? ), I always try it if it's put in front of me. This was one of those occasions where I was pleasantly surprised. The cod skin was crisp and actually quite sweet, and the roe puree gave a nice salty contrast. 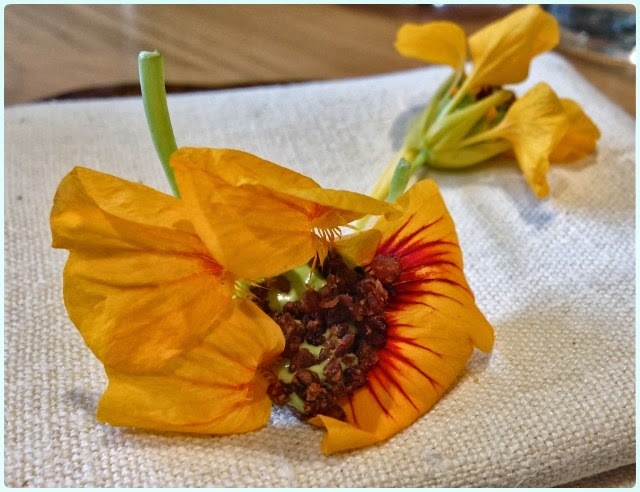 Nasturtium with oyster purée and breadcrumbs: It's recommended that this is eaten in one bite so you get a good mix. Flavours are quite subtle, but this is all about the texture. 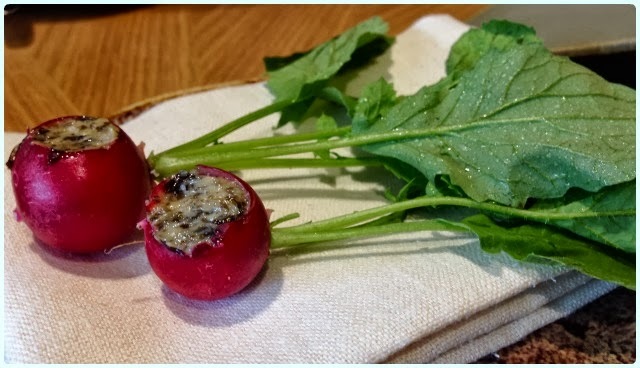 Radish with seaweed butter: I find radishes a bit hard work, but stuffing them with seaweed butter alleviates this problem. This wasn't too salty as I imagined, it was actually verging on sweet. 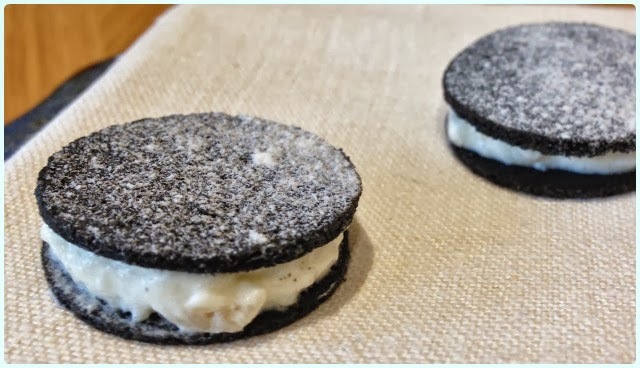 Storeo cookies - squid ink biscuit with smoked eel filling and vinegar powder: This was a beautiful dish. The biscuits had a lovely crisp texture and the eel filling was almost mousse-like. When eaten together they were rather moreish indeed. English corn barbecued, with corn custard: One of my favourite dishes of the day. 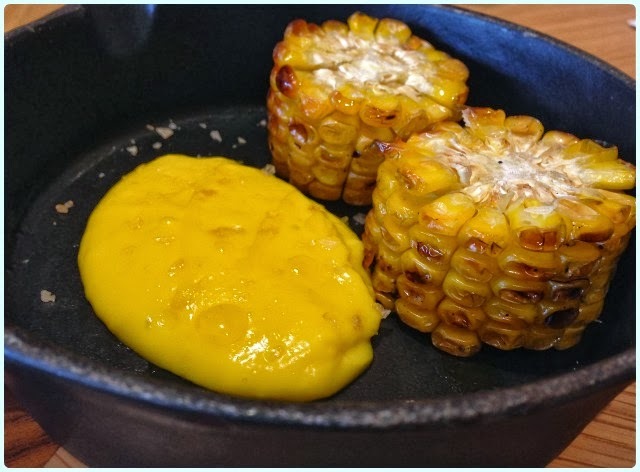 Crisp edges on the corn and that delicious corn custard... I could eat it every day of my life. Welsh rarebit/rabbit: Rabbit is mortal enemy number one - not rabbits themselves, but eating them. The staff were just lovely about this and so made me a mini rarebit instead. Nice touch. All the components of the classic dish were broken down then put back together once eaten. Bread and dripping: God I'm a sucker for a clever gimmick. Dripping candle? Yes! How very Harry Potter of you. Bread wrapped in a purple leather pouch, dripping and a pot of meat, jelly and cabbage. Simple yet majorly effective. 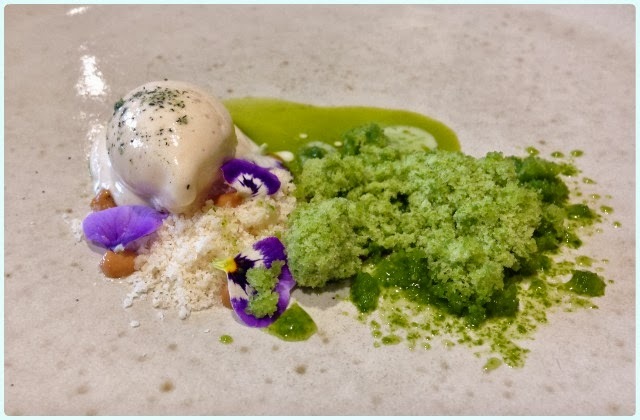 Onion and English plum: What a pretty dish this was. 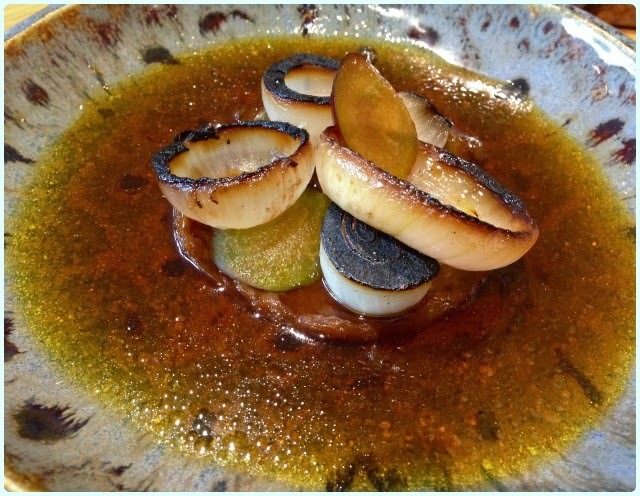 I loved the charred bits of onion, which were lolling along in the sweetest onion consommé, and perched on plum purée. Heritage potato, turnip and coal: We were told that these spuds were grown in chalk soil in a climate similar to that in the Champagne region, just to get the right taste. For a humble potato dish, this creamy little number was an absolute masterpiece. I could have eaten a full bowl. 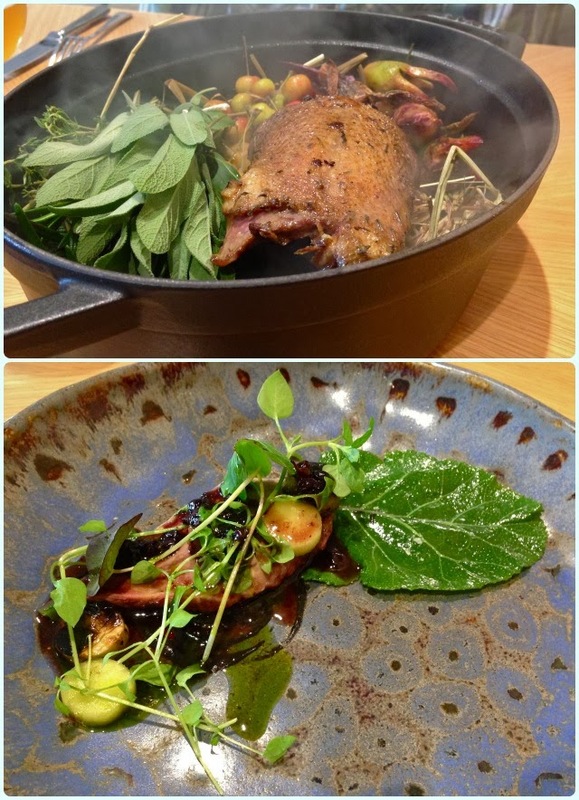 Wild duck, apple and bilberry: Before we received our potato dish, we were shown the duck whilst it was still being smoked in its stock pot. It was sat on a bed of hay, surrounded by fresh herbs and berries. It smelled divine. It was later presented with fresh leaves and a thick bilberry sauce. Real autumnal food. 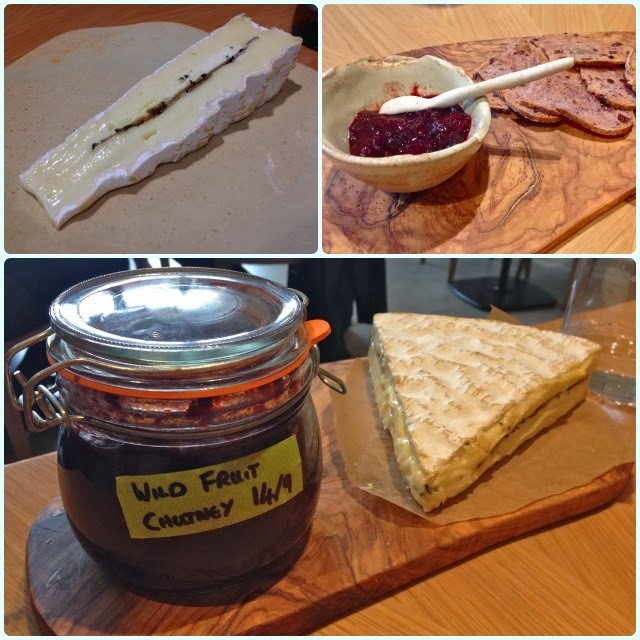 Brie with black truffle and wild forrest chutney: This was an extra course we chose before desserts. This beautifully gloppy cheese had a layer of black truffle running through the middle, and came with a small pot of wild fruit chutney and fruit bread. 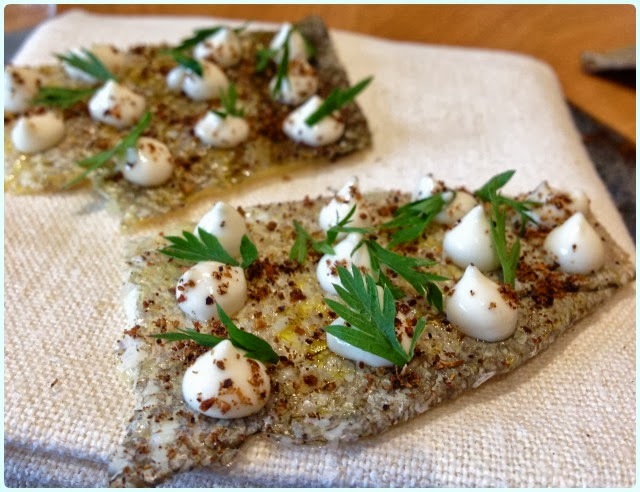 Almond and dill: By far the best course of the meal. Sweet almond with a slight bite, and fresh dill served with cold ice cream. It was out of this world. 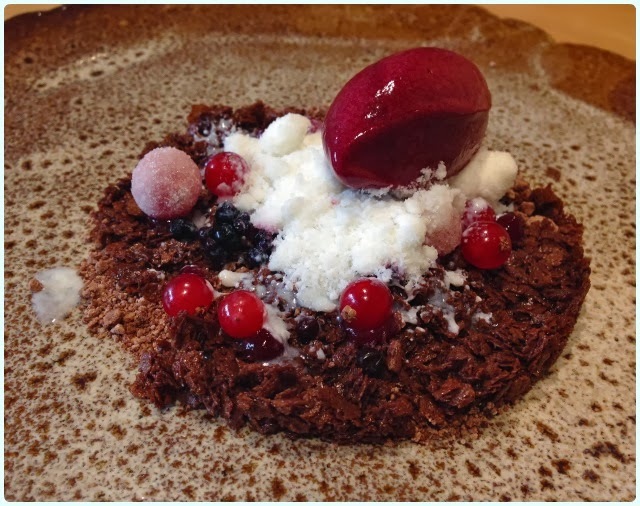 Wild berries, chocolate and buttermilk: For those of you familiar with Aussie Crunch, yes, the base did taste a little like it but without the coconut. The addition of berries and that fresh sorbet was just a stroke of genius. Tea cakes with rosemary and jasmine: It's genuinely upsetting how good these were. 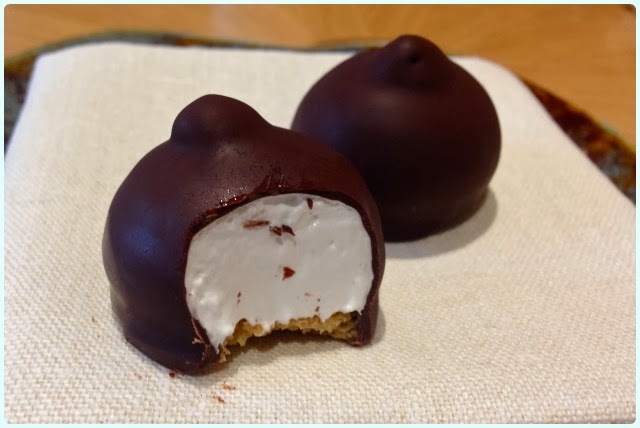 The shortbread base was thin and crisp, the fragrant marshmallow was gooey and the chocolate cold with a good bite to it. If M&S did these I'd be in trouble. Plum purée with goat's milk foam: Although I loved the presentation, this was the only course I wasn't really fond of, but that was personal preference. I found the goat's milk quite strong against the sweet plums. No complaints from my husband who polished both. Tea and coffee: Nicely presented and provided a much needed shot of caffeine before we departed. 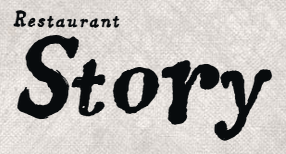 Despite its bustling location, Restaurant Story is a little oasis of calm. If it had been a book, it would perhaps be an Enid Blyton novel: written with memories of childhood, the hope of something magical, with a little bit of adventure thrown in for good measure. My name is Rachel and I am a Bundt-o-holic. My house is full of bundt pans. They take up most of my kitchen, my dining room and much to my husband's delight, they now also reside in his study. If you've never baked a bundt before, now is the time to have a bash. They are the ultimate friendship cake because they are large enough to share, and cut into lovely uniform pieces. They're moist, have a wonderful sugar crust, and come in an array of flavours and shapes. I make a bundt every month for my Clandestine Cake Club, and over the past couple of years have coached probably hundreds of you to make the perfect bundt. Now then, it's that time of year... National Bundt Day is nearly here! On 15th November 2013 the UK will celebrate its first official National Bundt Day. This is something that has been celebrated in the US for a few years, so it's time we got a slice of the action. Some of you may remember I flew the flag for the UK last year, but this year Nordic Ware have recognised that we deserve our very own celebrations on this side of the Pond. And boy do I have a treat for my little band of bundt bakers! 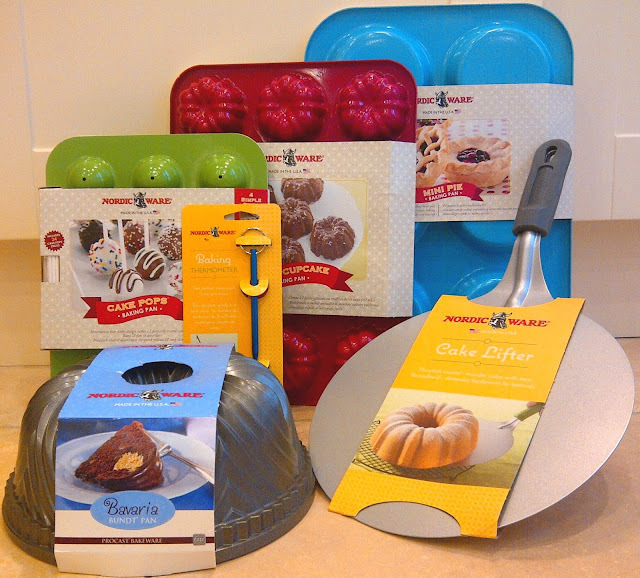 Not only do I want you to share your bundts in a very special Nordic Ware Linky, but I have the best competition ever. Ever. Yes, it is an absolute corker, and could all be yours by entering by National Bundt Day giveaway below. Easy peasy. The competition runs until midnight on 30th November 2013. We would also love to see your own creations using Nordic Ware Bundt pans. Why not show off your bundts using the Linky tool below? If you're a blogger, please link back to this page to spread the word. If you don't have a blog, you can link up pics from your Facebook, Twitter, Tumblr, Flickr, Pinterest or Instagram by right hand clicking on the picture and selecting Image URL. Just paste it into the Linky. 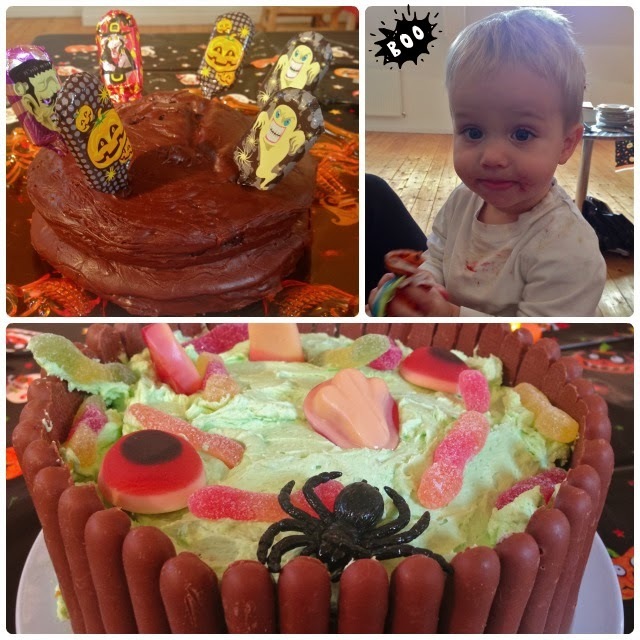 A few weeks ago my blogging amigo, Mr Hoss sent me a picture of a familiar looking cake. It was round with a hole in the middle 'like a polo' (he knows no better bless him). I knew any baker of bundts was a friend of mine. Trove went onto 'the list'. Fast forward... My husband was spending the day in Manchester with some mates, and if I stayed at home, would have been hutch-bound and one very grumpy Dolly. That's when it came to me... I would get on the train with him, but go on a daring expedition... I am not a fan of dining alone, but I was willing to make an exception - they had cake dammit! Three trains later, I found myself in sunny Levenshulme. A five minute walk from the train station lies Trove; a little haven on a bustling road full of odd shops and people driving too quickly. It feels a little out of place, but as soon as you step inside you are transported to the type of establishment you may expect of Chorlton or Didsbury. Is this a sign that Levenshulme is next for the cool kids...? I've heard their market is a bit of a corker too. There are no overbuttered teacakes or greasy fry-ups here. 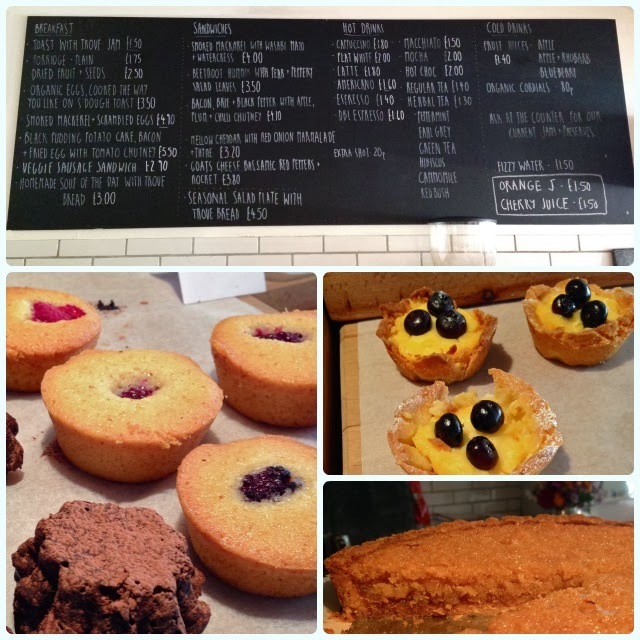 Trove pride themselves on homemade bread, organic jams and fresh cakes. Although I was starved, the warm waft of fresh bread made me want something on a white bloomer. 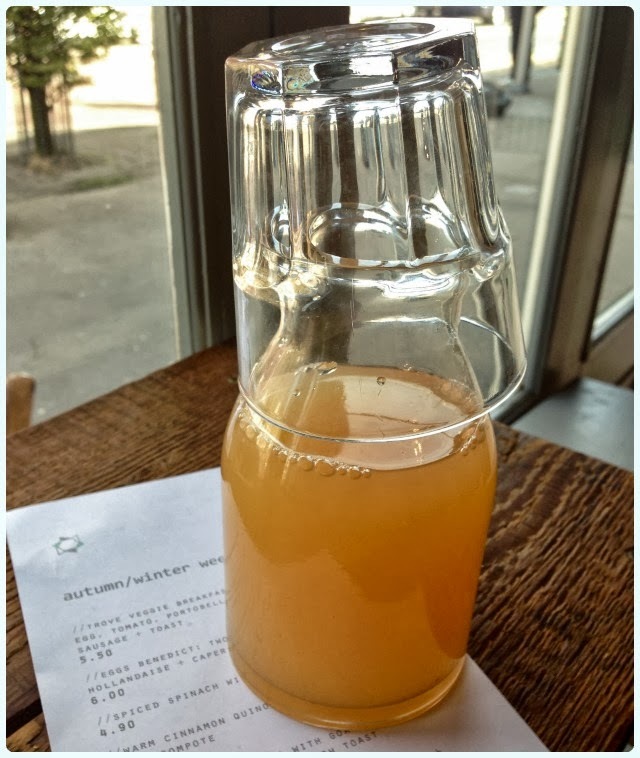 Apple and rhubarb juice: an absolute bargain at £1.40 for a decent sized carafe. This was mind boggling stuff! Sweet, tangy and very refreshing. No juice will ever taste as good again. 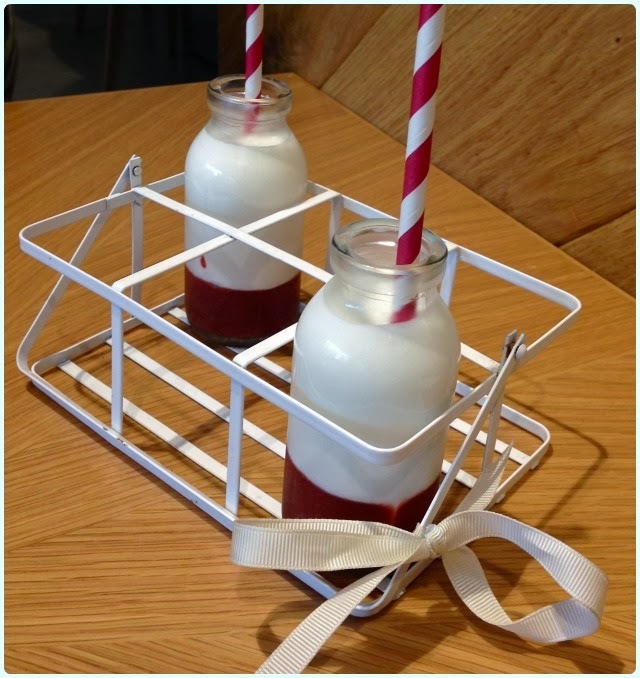 They also had fresh cherry juice too, which I was strangely intrigued by, but in my haste forgot to order later on. Buffoon. Mellow cheddar with red onion marmalade and thyme: I'll be honest with you. When this rocked up with quinoa, I was a bit put out. Trust me - this works. The bloomer was soft with a chewy crust, the cheese generous and creamy, and lashing of home made onion marmalade did the trick. 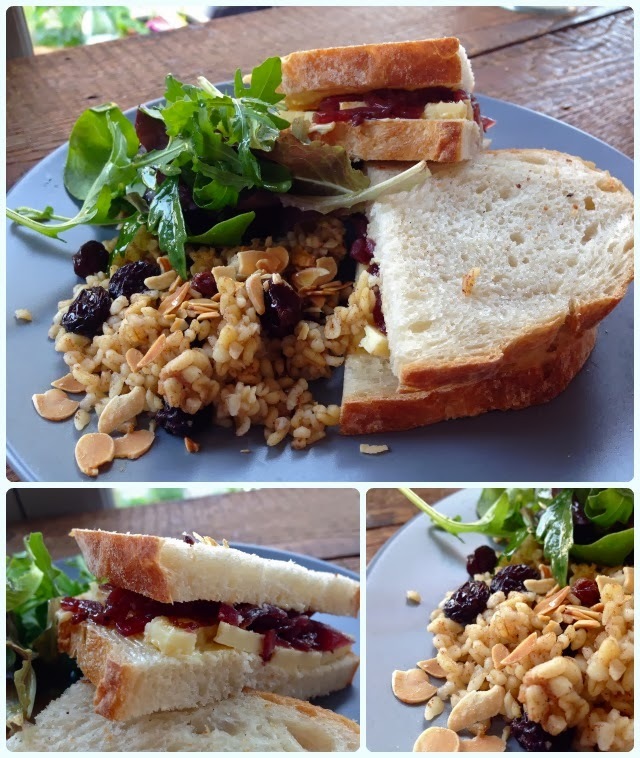 However, the star of the show was the cinnamon quinoa with dried fruit and toasted almonds. Gee whizz this combo is outstanding. 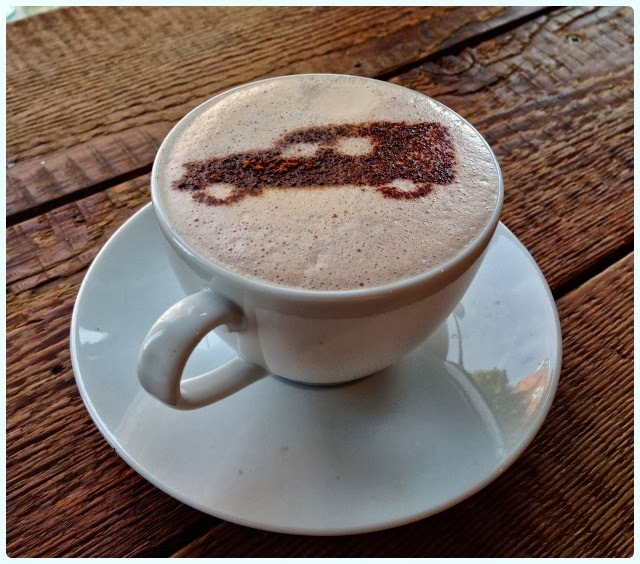 Hot chocolate: I saw someone else having a hot drink with a van on it... I wanted one too... Any establishment that puts a van on their drinks shall be considered friends. 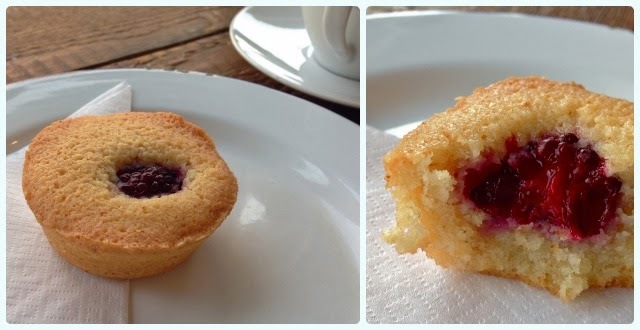 Blackberry financier: I was giddy as a kipper when I saw these. My all time favourite dessert was a financier. I'm a sucker for anything with a ground almond base: that sticky top, soft crumb and moist finish. Pop fruit in it and you're onto a winner. I prevented myself from buying more to take home. I pined for them all evening. I adored Trove. I loved the people, the window seat where I could watch the world go by, the fact they served cinnamon based grains with my sandwich and of course the wonderful choice of cakes. Trove is a happy little shop full of happy people.